Because I striped it naked and it teased me two days for that. This Rokkor had a very stiff focusing ring. So stiff that after a couple of hours outside on a November day it was barely moving at all. 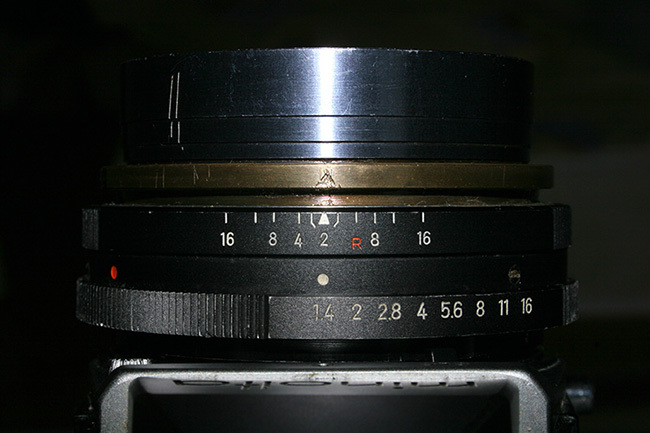 Since I a also have an MC Rokkor 58/1.4 I decided I might as well give it a go and try servicing it. 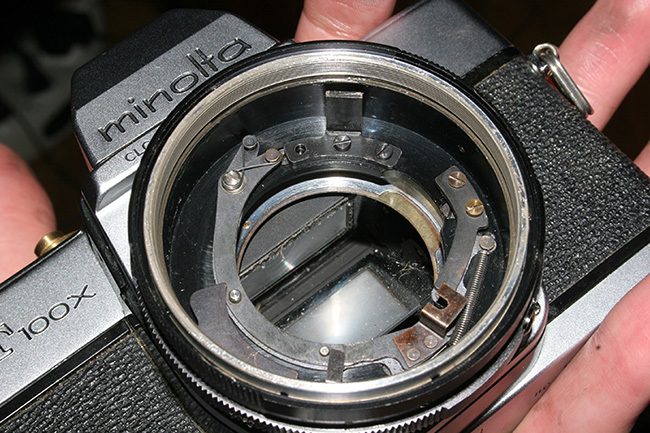 The first step was to remove the trim ring from the front of the lens. Ideally I should have used a spanner wrench but since I don't have one, I used a vernier caliper instead. 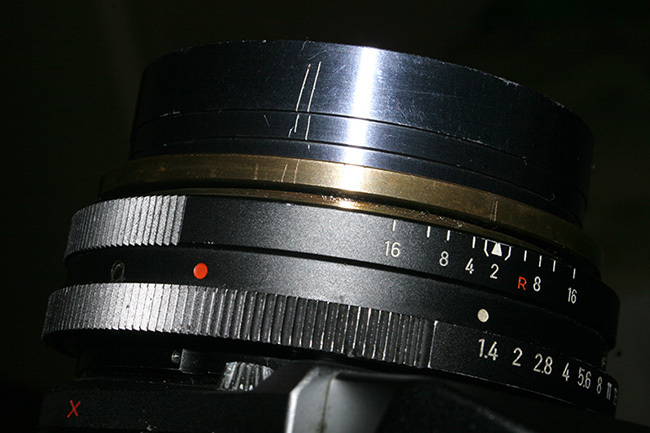 A lot of care is needed because any mistake in handling it will lead to either a scratched black ring (and usually these scratches tend to be deeper than the paint layer) or worse, a scratched or even chipped lens. 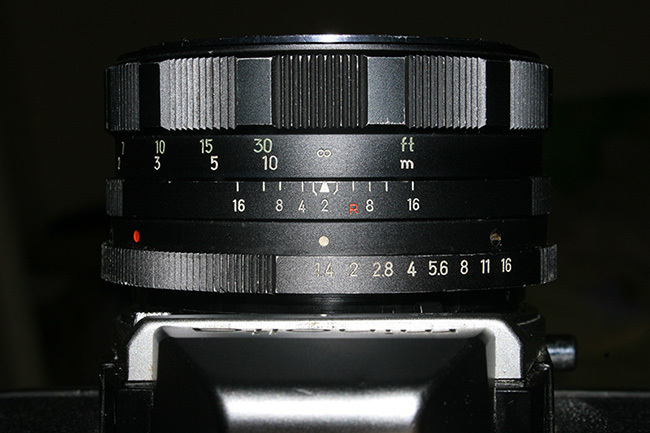 After the trim ring has been removed, you can see three more rings holding in place the entire optical group to the helicoid, the front optical group to the aperture system and the lenses from the front optical group together (resectively). For the moment just unscrew the first ring (the brass-looking one). You can now remove the entire optics (and aperture system) from the lens body. You will notice a brass ring to the front of the assembly. 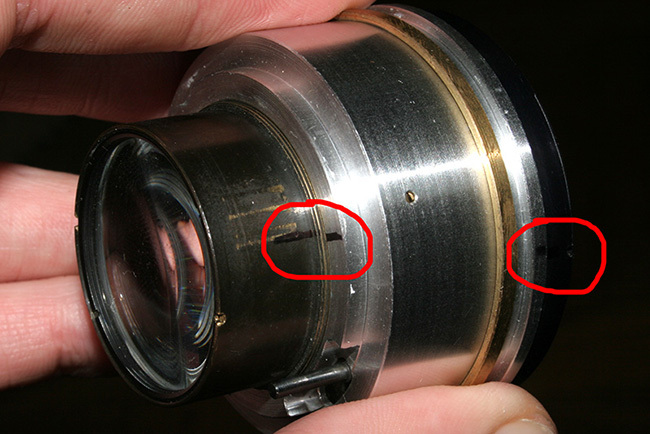 It does not screw into place so if you take it off don't forget to put it back before reassembling the lens. 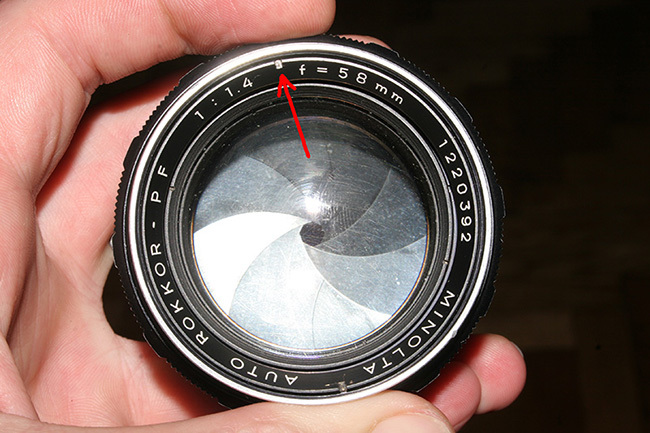 You'll also notice that I've made some marks in order to know exactly how much to screw the front and rear lens groups back to the aperture system (this image was taken sometime in the middle of the process and that's why the lines are perfectly aligned). If the aperture system is working properly and there isn't any dust in there, you might as well leave it be. Otherwise it's time to unscrew the optical groups from the aperture system. To clean the apertures just drop some lighter fluid (I have a Zippo can) on the blades while working them back and forth with the aperture pin. Repeat this a couple of times and then leave it alone to dry. Don't pun anything on the blades. They only need to be perfectly clean to work. Here you can see what thingy goes where, for when you'll be reassembling this toy. 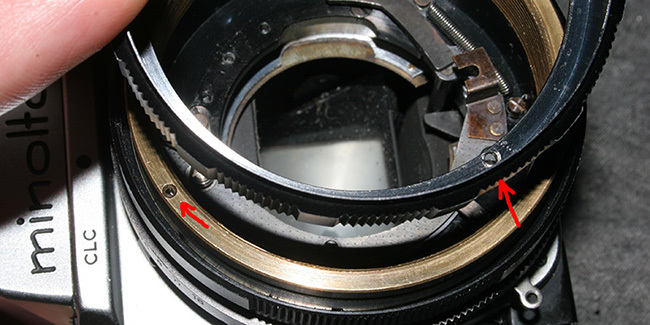 The aperture pin must engage the brass connector on the lens body and the tab on the aperture system must engage the slot in the inner helicoid (as marked in the image below). While replacing the optical group back to the body you'll have to push it just until the pin engages the connector and then, if needed, rotate the whole assembly until the tab also aligns with the slot. Only now can you push the assembly the whole way. 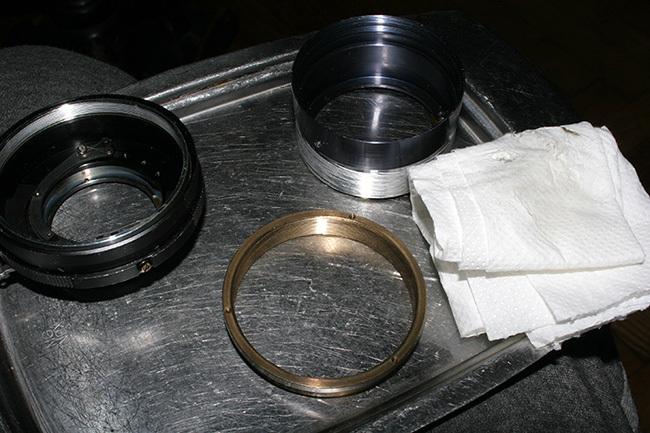 Now here comes the tricky part: the disassembly and especially reassembly of the focusing system. If you do it my way (just take it all out without paying attention), you'll probably spend a good few hours putting all back together the right way (or just follow this tutorial :)) ). So it is extremely important to mark things with a sharp thingy (a screwdriver in my case) and be very attentive to what you're doing. 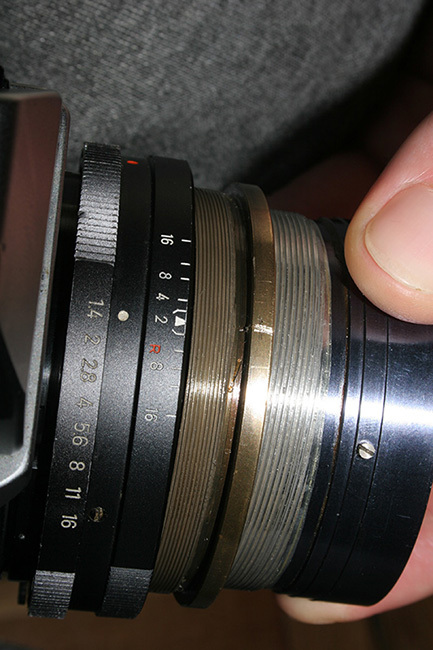 In this image you can see the focusing ring on it's infinity position. 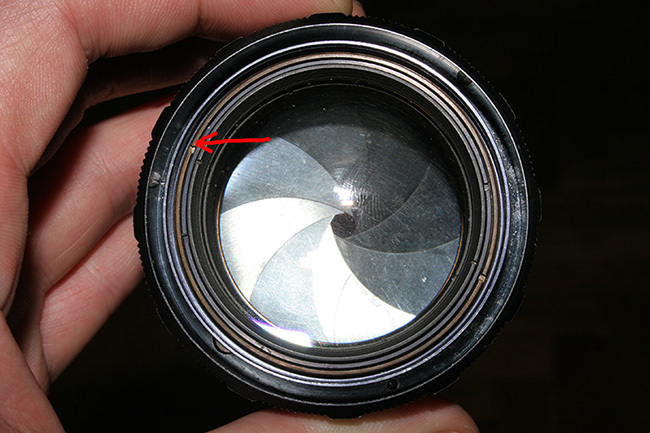 The ring is held in place to the helicoid by means of three screws (see the last image) that you can reach with a small screwdriver (slotted, no.2) between the inner side of the ring and the outer side of the helicoid (while looking at the lens from the front). Unscrew them and remove the ring by a pull-and-twist motion (the ring has a small cutting that will allow it to pass a screw on the lateral of the helicoid). 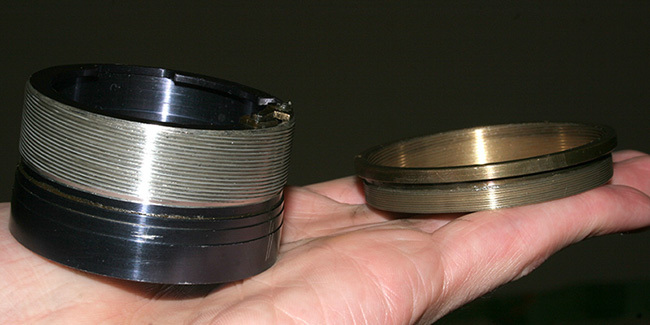 These are the two helicoids. You can see here the T shaped tab keeping helix2 from rotating and the aperture connector (along with the rest of the lens mechanism that is of no concern right now). This is the lens into pieces. 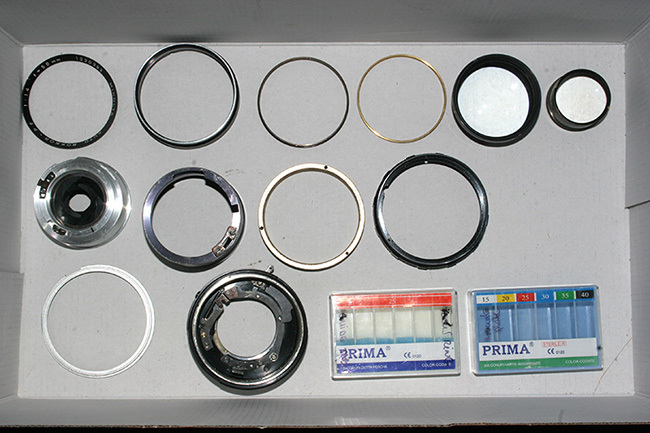 From upper left to lower right> trim ring and decorating outter ring, the ring keeping the optics in place, the brass threadless ring, the front optics, the back optics, (second row) the aperture system, helix2, helix1, focusing ring, (third row) aluminium protection ring on the base of the lens (on the mount), lens body and the my little "screw trays". 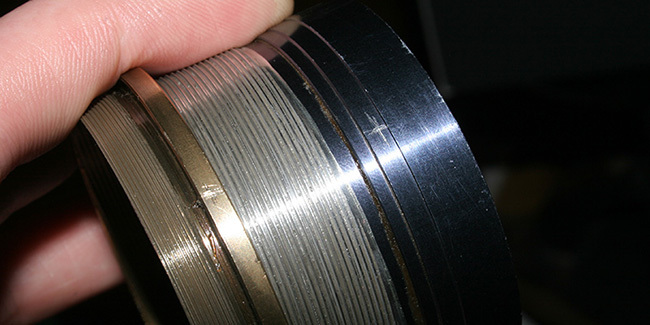 The helicoids after a good cleaning with ligher fluid. For relubrication I've used some lithium-calcium grade 2 multipurpose grease, diluted in mineral oil for fine mechanisms (undiluted it was much to thick and focusing was still far from a smooth experience). I've used a very small amount of grease. Very small! A q-tip soaked in the grease and then wiped of in a tissue is more than enough for all helicoids. 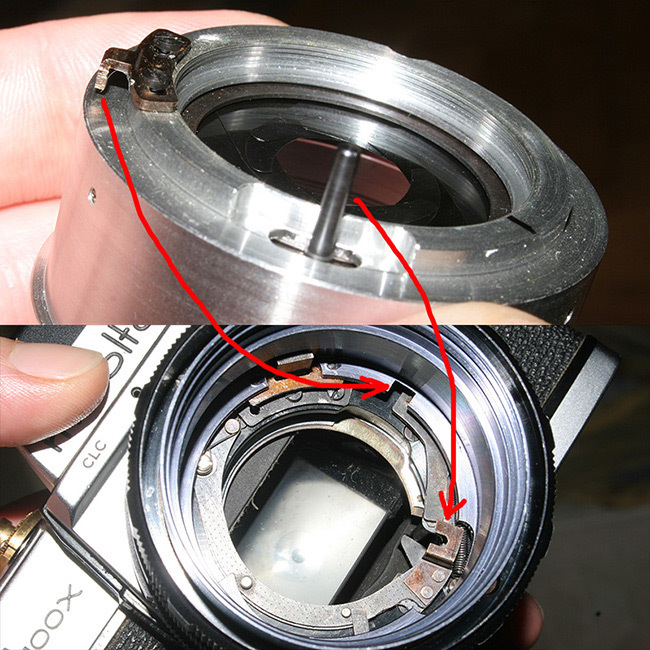 This is the completely screwed in position of helix1 related to the focusing ring detached from the lens but in it's infinity position. Note that misalignment of the holes, giving you that "x" of a turn mentioned above. Put it all back in reverse order and go out and burn some film ;) Of course, I'm just an amateur so I stand corrected.